Hey! Coming at you today with an AMRAP Full Body Workout! AMRAP stands for ‘as many rounds as possible’. You will need a timer and a chair/bench/step for your step ups and tricep dips! And don’t forget to check out the new GMF FitCamps! 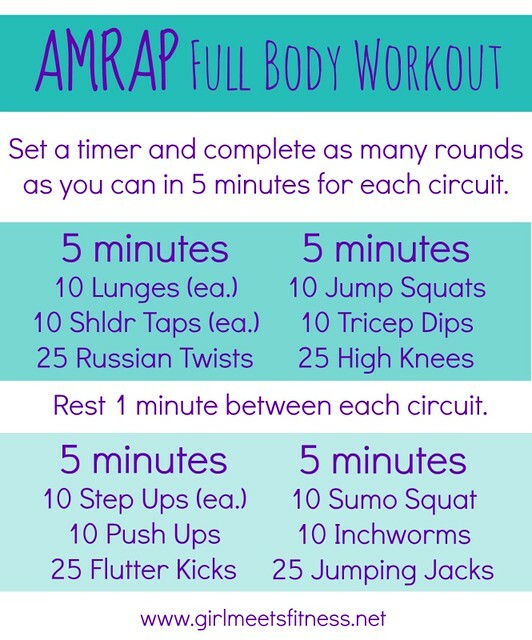 For each circuit you will set your timer for 5 minutes and complete as many rounds of those 3 exercises you can before the timer ends. After those 5 minutes, rest for 1-2 minutes, and move on to the next circuit starting your 5 minutes over. This whole thing should take 25-30 minutes. Don’t forget to check out other workouts too!